The launch of WearCheck Mobile, our brand new interactive condition monitoring application (app), enables customers to have vital information about the condition of their components at their fingertips 24/7/365. 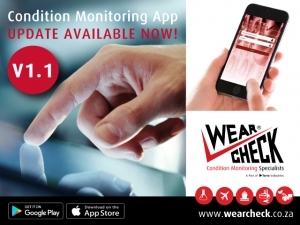 Managing director Neil Robinson believes that WearCheck is one of only a handful of condition monitoring companies in the world, and possibly the first in Africa, to develop and launch an app of this nature. He is confident it will substantially improve customers’ benefits from their condition monitoring programme by allowing them to make virtually instantaneous maintenance decisions based on reliable data which is highly accessible. Our customers can now download WearCheck Mobile and, at their fingertips via their mobile device, access a host of critical information pertaining to machinery condition. This data is immediately available even while patrolling the factory floor or inspecting mining machinery on-site. 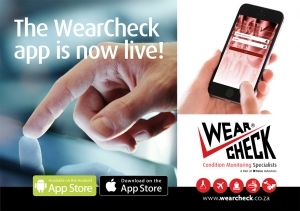 To download the free app, visit either Google Play Store or Apple Store and search for WearCheck Mobile. WearCheck’s IT manager Eddie Perumal outlines some of the app’s features. ‘Customers can access reports and view their current samples list. As an optional feature, this keeps track of unread web/app reports, and notifications about items on this list are sent out as reminders. ‘Sample reports can be viewed on the mobile device as either one page (“concise”), or two page (“full”) pdf documents. Single or multiple pdf reports can be emailed to different recipients simultaneously. ‘Sample data can be submitted, either via the equipment/component search option (recommended), or via the “submit samples” option, where equipment/component verification is needed for currently-listed machinery. Where applicable, new equipment/components information is created in the WearCheck system. Customers can also view their five-day submission history. WearCheck IT manager Eddie Perumal shows off some of the devices onto which the brand new WearCheck app has been downloaded – it is compatible with Android and Apple (iOS) systems and gives maintenance managers immediate access to crucial data about machinery components, at their fingertips.